It’s that time of year again when the seabirds come back to our shores. 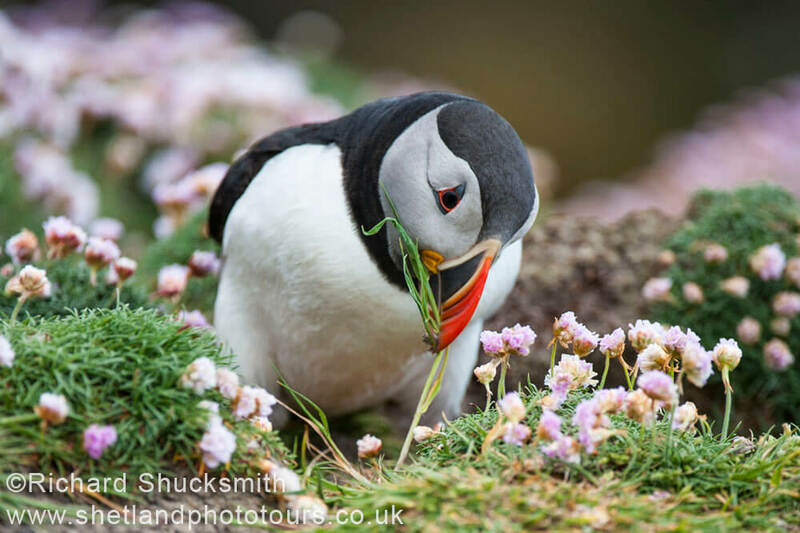 Puffins are one of the most adorable, and much loved of our seabirds, but we only see the puffins each year for a short period of their lives, when they come back to Shetland’s grassy slopes, often on top of vertical cliffs to rear their chicks. There is nothing better than sat on a cliff top watching puffins going about their business, but what is puffin business? Well, at this time of year, much of the behaviour seen on the cliffs is related to courtship and mating. The classic bill tapping of two puffins is often carried out between sexes, and is related to pair bonding. You may see a puffin opening his mouth wide known as gaping. Gaping is a threat used by both sexes, where the bill is held open, the tongue may be raised and the neck feathers erected with increasing threat intensity. It can be followed by a swift bite to the opponent. You can even get gape contests, where the contestant’s beaks are angled up slightly, opening and closing slowly, and often with a low ‘creaking’ call. They avoid eye-to-eye contact by turning their heads in such a way that each bird turns to the left or to the right in unison. The yellow mouth lining is vividly displayed during each gape. The contest can stop when one of the birds quickly moves or flies off, if not a full fight can take place. Although I love watching the puffins on land, they spend a large majority of their lives at sea. During ferocious winter storms they are normally far offshore, and I often wonder about these little birds riding those towering waves, and in long lasting storms many can perish. It is the fact they spend so much of their life at sea that made me want to try and capture them underwater. They feed in the summer by carrying out lots of very short dives, often only lasting 30 to 40 seconds, to depths of 4 to 7m, with a very short rest between each dive, often no more than 6 to 10 seconds. 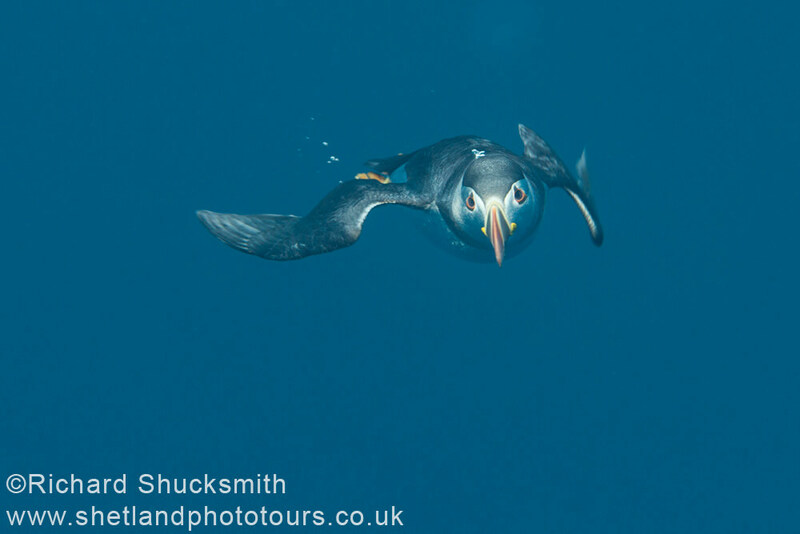 One puffin was recorded to do 442 dives in just two and half hours, and spent 70% of that time underwater. They catch fish on average two out five dives, about a 39% success rate. They can dive much deeper, and have been recorded to depths of 50m or more, but interestingly they don’t dive at night. This probably indicates they rely purely on their eye sight to catch prey. With this in mind I came up with a ‘puffin plan’ to photograph them underwater, which involved wearing home-made puffin models on my head and arms. 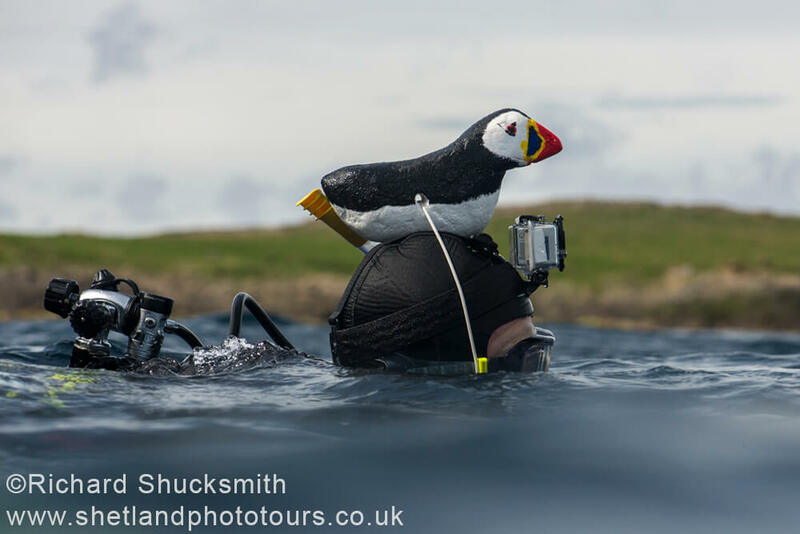 This I hoped would fool the puffins into thinking that lots of their friends were already around this funny looking diver, so would allow me to get close enough to take pictures. Taking images underwater I have to cut down the distance between myself, and the subject for the images to be sharp and colourful, otherwise they look washed out. With all my dive kit, a puffin on my head and arm, it was not long before I was amongst a small flock of puffins with some of them swimming straight towards me. 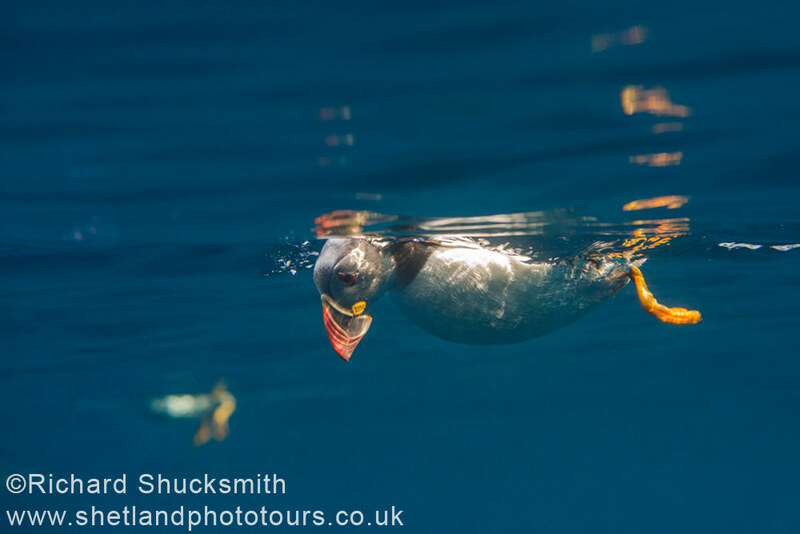 Some of the puffins were very inquisitive, and came to have a look at the puffin models but they never stopped for long, before they would either dive or swim away on the surface. However, they did come close enough to get some images, to which I was very pleased or the mickey taking on the boat would have got even worst. 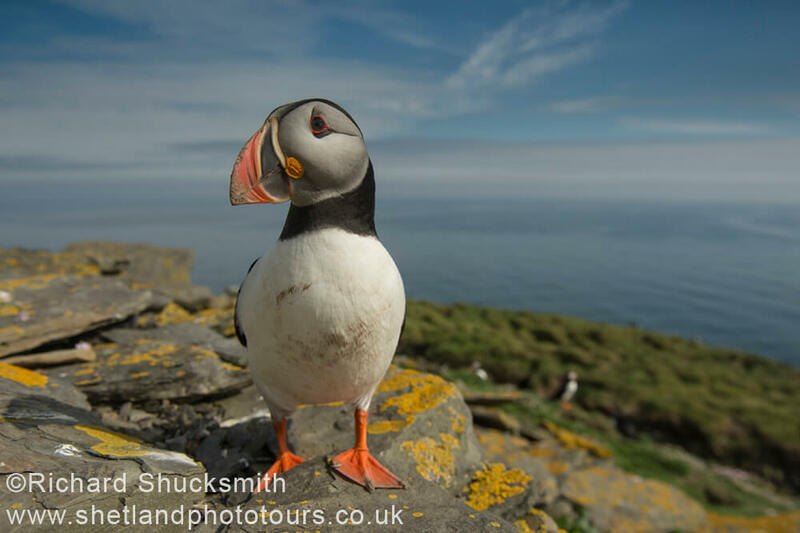 Shetland is a great place to come and photograph puffins, with some major colonies offering a diverse range of dramatic coastal scenery as a back drop. It is very easy to combine photographing puffins with otters and week does not seem long enough. 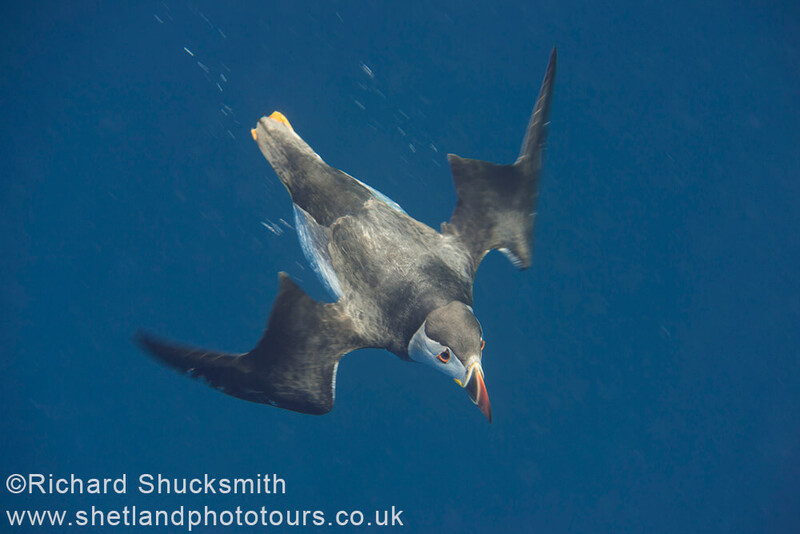 See the photo tour page for photographing otter and puffin workshops.